Everyone else is in bed before 10 pm… here I am… trying to pick up the last of the food and trying to wipe the glaze from my eyes so I can blog. I didn’t really “work” today, all I did was handle the food and rotate through the grandsons, alternately entertaining them and putting them to sleep… but I’m tired too! So, I’ll leave most of the photos for tomorrow, as I’m not really overanxious to spend the next hour blogging. The sunset tonight was rather spectacular… and a friend’s horse was so nice to pose in front of it for me! Ohhhhh how I love that photo. 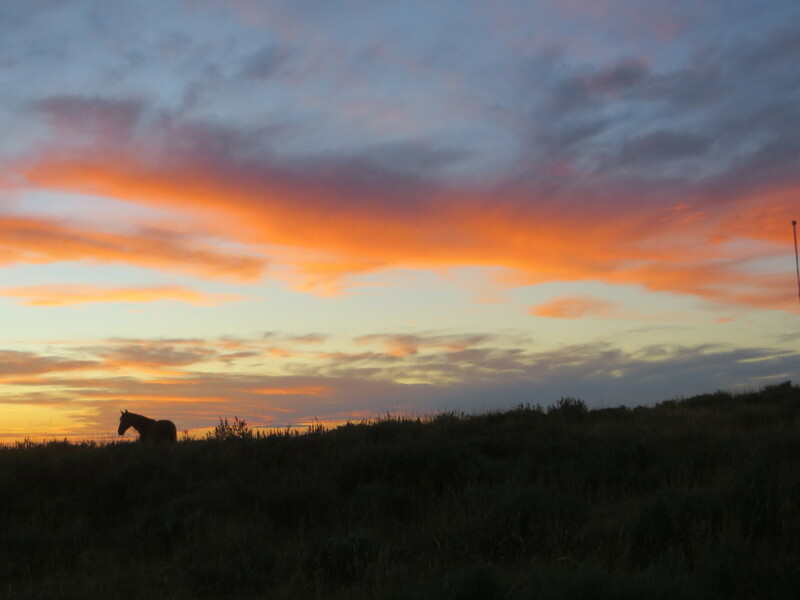 Big sky and beautiful sunset and a horse. Aw poo! The sterotype that so called ‘womens work’ isn’t real work comtinues. Dang I’d hoped that at some point providing food and caregiving would finally be considered real work. Not this generation, maybe the next.